Established in 2004, Carolina Marine Structures, Inc. is a leading provider of waterfront structure construction and marine construction services in the Southeastern United States. Specializing in marine construction enables us to keep abreast of technological developments and regulatory issues specific to wetlands and coastal areas. CMS most valuable resource is its staff of knowledgeable, experienced and goal-driven personnel. Each employee has a passion for excellence and strives to exceed expectations on each and every project. Extensive knowledge and experience aids in solving difficult strategic and logistical issues on a wide variety of projects and has been essential to the company's growth in all phases of construction which allow consistent delivery of the best results in the industry. In addition to its distinguished staff, CMS owns an extensive fleet of state-of-the-art, well-maintained construction equipment. This fleet allows CMS the diversity to perform a wide variety of services, especially those that require custom low ground pressure (LGP) and floating type equipment. 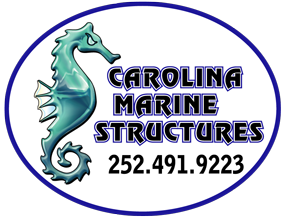 Carolina Marine Structures corporate office resides in Powells Point, North Carolina and is centrally located for its preferred service area of coastal North Carolina and Virginia. CMS' North Carolina Maintenance Operations center is located in Powells Point, North Carolina. The Virginia Waterfront Operations and Maintenance Operations center is located in Chesapeake, Virginia. Our staff brings extensive knowledge and experience to each assignment. Solving difficult strategic and logistical problems on a wide variety of waterfront projects has been essential to the development of our expertise in all phases of marine construction and allows us to consistently deliver the best results in the industry. The mission of Carolina Marine Structures, Inc. is to provide the finest and most comprehensive marine construction services in the Southeastern United States. From shore and wetlands protection to bridge and marina projects, we build on a solid foundation of excellence and integrity that is second to none.